It's a scientific fact that you'll have fun wearing these colorful Big Bang Theory pajama pants! 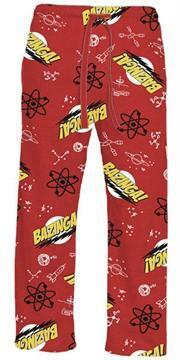 The Big Bang Theory Bazinga Pajama Pants are red with a soft, thin material and a drawstring waist. They feature the atomic symbol logo from the hit sitcom The Big Bang Theory, along with other science-related images, and the word "Bazinga!" in yellow letters on a white circle background with a black lightning bolt. That's the word Dr. Sheldon Cooper says when he pranks his friends, and its design is a takeoff on the lightning-bolt logo of Sheldon's favorite superhero, the Flash!